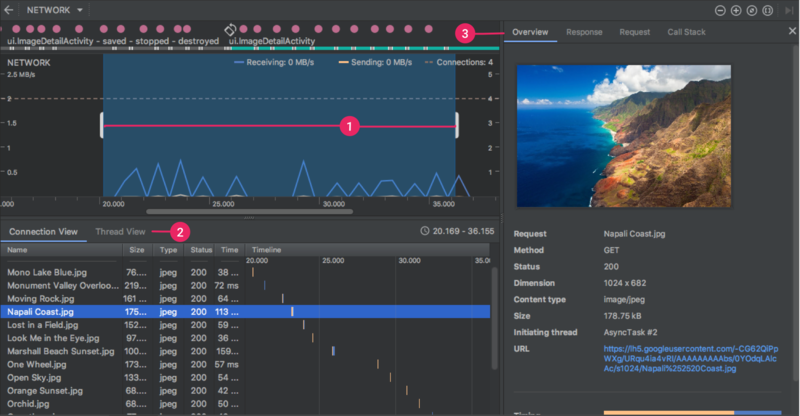 The Network Profiler displays realtime network activity on a timeline, showing data sent and received, as well as the current number of connections. This lets you examine how and when your app transfers data, and optimize the underlying code appropriately. Click View > Tool Windows > Profiler (you can also click Profile in the toolbar). Select the device and app process you want to profile from the Android Profiler toolbar. If you've connected a device over USB but don't see it listed, ensure that you have enabled USB debugging. Click anywhere in the NETWORK timeline to open the Network Profiler. To select a portion of the timeline, inspect a list of network requests sent and responses received, or view detailed information about a selected file, you must enable advanced profiling. When your app makes a request to the network, the device must use the power-hungry mobile or WiFi radios to send and receive packets. The radios not only use power to transfer data, but also use extra power to turn on and to stay awake. Using the Network Profiler, you can look for frequent, short spikes of network activity, which mean that your app requires the radios to turn on frequently, or to stay awake for long periods to handle many short requests close together. This pattern indicates that you may be able to optimize your app for improved battery performance by batching network requests, thereby reducing the number of times the radios must turn on to send or receive data. This also allows the radios to switch into low-power mode to save battery in the longer gaps between batched requests. For more information about techniques to optimize your app's network activity, read Reducing network battery drain. At the top of the window, you can see the event timeline. On the timeline, you can 1 click and drag to select a portion of the timeline to inspect the traffic. 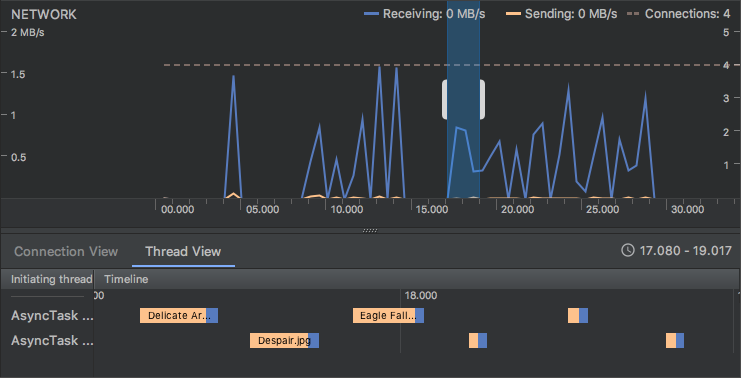 Connection View: Lists files that were sent or received during the selected portion of the timeline across all of your app's CPU threads. For each request, you can inspect the size, type, status, and transmission duration. You can sort this list by clicking any of the column headers. You also see a detailed breakdown of the selected portion of the timeline, showing when each file was sent or received. Thread View: Displays network activity of each of your app's CPU threads. As shown in the figure 2, this view allows you to inspect which of your app's threads are responsible for each network request. From either the Connection View or Thread View, click a request name to inspect 3 detailed information about the data sent or received. 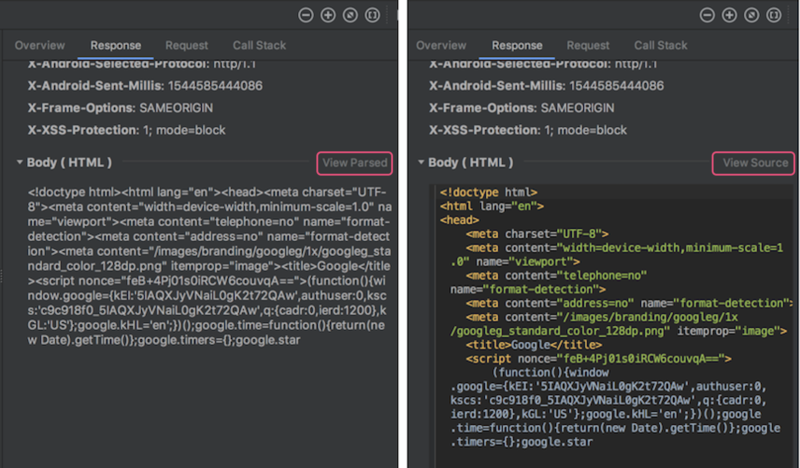 Click the tabs to view the response header and body, request header and body, or call stack. On the Response and Request tabs, click the View Parsed link to display formatted text and click the View Source link to display raw text. Note: If you are using the HttpURLConnection API, you won't see headers in the Request tab unless you include it in your code using the setRequestProperty method, as shown in the sample below. // Sets acceptable encodings in the request header. Currently, the Network Profiler supports only the HttpURLConnection and OkHttp libraries for network connections. If your app uses another network connection library, you may not be able to view your network activity in the Network Profiler. If you have received this error message, but your app does use HttpURLConnection or OkHttp, please report a bug, or search the issue tracker to include your feedback in an existing report that's related to your issue. You can also use these resources to request support for additional libraries.